The New Mk8 Fiesta EcoBoost 1.0 turbo is going to benow a firm Pumaspeed Power favourite, with power upgrades available up to 200 plus bhp coming the first thing most people do is change the tone and add flow to the exhaust system of the car. 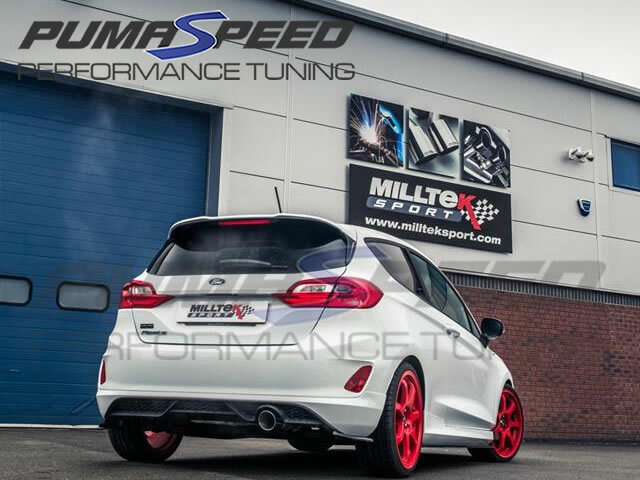 This Milltek system gives the perfect finishing touch to the rear bumper of any Fiesta EcoBoost and the noise is on the correct side of the just right. The Road + option has a rear back box and no silencer in the center giving a sporty tone, while still being louder than the EC Approved Full resonated system it is not as loud as the Non Resonated system. The Pumaspeed Workshop team are ready to fit the Road+ Milltek Sport Fiesta Mk8 1.0 Cat-back in our Head Office located here. Therefore making parts and labour a total cost £569.20 (inc. VAT). Pumaspeed have a specialist distribution team that can dispatch the Road+ Milltek Sport Fiesta Mk8 1.0 Cat-back to any destination worldwide.